As of last week, officials were waiting for results of ballistics testing in the Ohio Amish shooting case. However they are confident the bullet which killed Rachel Yoder was that fired by a hunter cleaning his gun. Kentucky Amish SMV triangle problems continue. Another Swartzentruber Amishman has been fined. Ananias Byler has refused to pay a $489 penalty for failing to display the orange safety triangle. Other Kentucky Amish were jailed last year for the same offense. Byler’s deadline is Thursday. The Kentucky Supreme Court has agreed to take up the Swartzentruber SMV issue, which could occur early this year. Not an update exactly, but another instance of Amish having horse problems. Last month we discussed the overheated Amish horse case in Pennsylvania. Now an Amish teen has abandoned a horse at the Wal-Mart in Middlefield, Ohio (the Geauga County Amish community). Back in November, the youth apparently removed the horse from his buggy, tied it to a rail, and left. Now the humane society is attempting to find it a new home. The 12 men accused of hair-cutting attacks on Ohio Amish will be arraigned in federal court next Wednesday. Five of them had been released, while the remaining seven have stayed in jail since late November, including leader Sam Mullett. As noted in this update (no longer online), Mullett maintains that he is not a danger and should be freed as he awaits trial. Good question Jessica. In light of Monday’s post I wonder if the young man is behind the wheel now. Richard, long time no see 😉 Glad you decided to come back and post, and I think 2012 is off to a good start. I actually just realized I don’t really have a good sense of what animal abuse penalties can be like. Michael Vick and the dogs (he did about 2 years in prison I think?) comes quick to mind but that seemed to be a fairly extreme case with the gambling ring exacerbating it. The hot horse Amish offenders were just fined. I cant imagine what would make a young man leave his horse. An act of rebellion, maybe? As for the shooting. In truth, Im not sure what charges could be assessed. Involuntary manslaughter maybe, however the problem of proof exists. Once the minnie ball is packed into a muzzle loader, it cannot be removed except via discharge. If you shoot into the ground, there is a danger of hitting a stone, causing ricochet that might affect those nearby. It is fairly usual to discharge into the air. I would question how much powder had been packed in, as it seems to have been more than necessary,however it is apparent to me that this was accidental. As for the beard cutters- I am sorry, but that man is pure evil. As the stories come forward of him using the others wives, boarding people inside their homes when they disobey, etc., it is obvious that he is where he needs to be. Lynn I am a near-total layman when it comes to guns, but that sort of surprises me that discharging in the air is fairly usual as you say…it seems like a designated dirt or sand pile might trump both the air and the ground? Discharging a weapon in the air is irresponsible and is never considered proper technique. The proper way to clear a weapon is in a designated discharge pit, or a proper backstop firing area. A discharge pit are easy to construct and are not expensive to build. More curious…what happened to the buggy he unhitched from the horse???? I’ve never seen a tandem buggy hitch! It is a bit of a mystery, isn’t it. Maybe the buggy got sold off and loaded up right there. I remember driving through W. VA, following an Amish buggy latched onto a flatbed truck down the interstate. No doubt headed for display in front of a business or to decorate someone’s yard. Yes, I agree with what you hinted in your first post, Erik. He likely had a ride waiting to take him to the “wild blue yonder”…or just somewhere else. At least he left the horse tied, so it couldn’t wander off and get hit by a car, and at least he tied him in a very public place – not in the woods where he might die of thirst. Recently, I received an e-mail from the humane society taking care of Wally. Wally is a good horse but not quite ready for adoption. Once he is available a press release will be done. Now, I’m trying to talk my husband if an 8 hour drive will be worth the trip for an abandoned buggy horse. Yesterday, I drove my 9 year old standardbred in our great 54 degree weather. Suppose to have our first snow tonight. Enjoy the day that God has given us! P.S. Erik thank you for the Amish up-dates. I, too have been following the Amish shooting and the abandoned horse issue. I pray that the shooting was an accident,even though the gunman was negligent. My father was a small game hunter and carried guns in his truck, which greatly frightened me as a child, even though he never got them out or handled them around me. He always said that a gun should never be shot off in the air, even upwards because a person never knew where the bullet would end up. As to the abandoned horse issue, I agree that the young man must have left the Amish lifestyle behind, and needed the horse and buggy to accomplish his escape. He probably did the best he could by untethering the horse from the buggy and tying it up, so that it could be rescued. Wondered also what happened to the buggy. I assumed that the horse wasn’t claimed because the young man’s family did not want to endure the humiliation of coming forward. Yes Erik, thank you for the updates, as these two issues had been on my mind. As for the Mullett case, I’ve seen news reports and believe that Sam Mullett needs to be locked up for an indefinite period of time. He is a very scary person, who seems to be willing to use sadistic acts to control others. I also don’t believe that he is truly Amish, but an anomaly. Today Sam Mullet and his fellow criminals pled not guilty to the crime of which they are charged. That’s ridiculous. Just how to do they plan to explain this…the tooth fairy did it? In my humble opinion, whatever happens to him punishment wise, I sure hope they shave and cut their hair to make them all clean-shaven as well. I find it to be a totally appropriate punishment. I have also been reading information brought forth by a former daughter in law who claims Sam is basically the leader of a cult where there is widespread verbal, emotional and sexual abuse of women and children. Although I realize this has nothing to do with the crime at the forefront, I would claim he deserves whatever he gets in triplicate! He’s an evil evil man! Could it be possible that the person who left the horse had sold it and left for the new owner to pick up? I have been keeping up with this story in the public media and was confused about whether the reflective tape was an option. 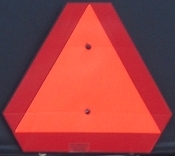 There are different reports about whether Kentucky law allows the choice of reflective tape (which the community agrees to use) is a equal option to the orange placards.